Thursday, Dallas School Board members will consider closing eleven schools to save millions of dollars. It follows severe state funding cuts that officials fear will leave next year’s budget nearly $40 million short. KERA’s Bill Zeeble reports some parents are fighting back. It’s busy at the end of the day in Bonham Elementary on Henderson Avenue. Parent Eileen Tuy gathers up her daughter and two neighborhood children to walk them home. Tuy went out of her way to enroll Naomi in Pre-K here at Bonham, a nine-time Exemplary school that has earned a national Blue Ribbon. That’s why Tuy and other parents are fighting for Bonham. Tuy: They said if the school closed, we would be sent to the closest school. I didn’t’ hear good feedback, and I was kind of scared. Putting her in a big school, because I grew up in a small school and I got a good education, I want to pass that on to her. I was thinking of other options like could we afford bringing her to a private school? Which, it’s hard. But still I’m hoping this school will stay open. 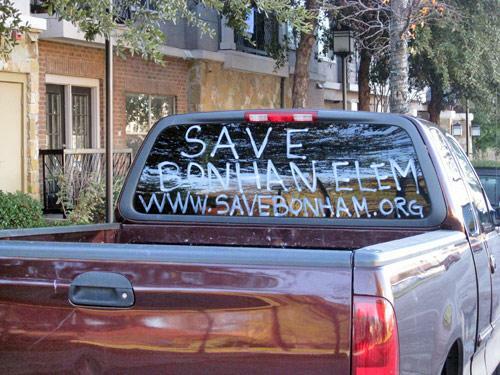 Parents have signed petitions, posted “Save Bonham” signs throughout the neighborhood, and scrawled their wishes on car windows. The Pre-K through 3rd grade campus holds just 250 students. Most are Hispanic, with incomes low enough that 89 percent of students qualify for free/reduced lunch. So these at-risk students have beaten the odds year after year with their performance. School Board member Edwin Flores says Bonham’s a great school. And he sympathizes with school’s devoted, passionate parents. But closing Bonham and ten other schools will save $11.5 million. Unlike the parents, he is not convinced education will suffer if the school closes. Flores: Buildings don’t educate students, people do, the teachers do. and we need the best teachers, we need to get the best principals, the best staff out of those schools, and we need to put those students in a better environment . These small schools, you don’t get efficiencies of scale…There are also facilities that are much newer, which means we can wire them for technology, the environmental systems are more modern. Bonham’s Talented and Gifted Teacher Ann Vogel Vargas disagrees with the trustee. She has taught here nearly two decades, and says closing Bonham would break her heart. She says its tradition of excellence runs deep. Vargas: Many people are here for generations. It’s going to be a tragedy for them because they have their sons and daughters and grand children here, I just said hello to some grand parents. We have a lot of people coming here and coming to our school because it’s such a wonderful school. Vargas understands her district’s dire financial dilemma, and suggests trustees find money elsewhere. She says maybe the district should hold off on the new, multi-million dollar teacher evaluation plan, the $3 million Teach For America contract, or the millions set aside for Alternative Certification. Vargas: All these are wonderful programs. Maybe it’s not the time for them, if we’re willing to do away with schools that have a strong community support, like James P. Bonham. Bonham is not the only Blue Ribbon or Exemplary Dallas campus affected by the budget cuts. H.S. Thompson is too, but the district plans to change it, not close it. Two other schools are Recognized by the Texas Education Agency. One is Arlington Park, where nearly half the students are homeless. Some Trustees say that just because schools close now, they may not stay closed. In fact, many once shuttered in North Dallas have re-opened. That’s no consolation to Josephine Tijerina, whose 8 year-old son attends Bonham. Josephine Tijerina: This is home for him. It’s home away from home. I definitely don’t want them to close it, it’s a very good school.